5 miles on the schedule today....done. Much warmer today with humidity. Back to short sleeves! So this morning, I'm running my regular route coming out of our subdivision and this guy in a truck is coming past me from behind. Mind you, I'm on the left side of the road running against traffic(of course, there is none at 5am). So he comes by as I'm turning left and he turns left and lays on his horn for like 5 seconds. It's not like I was running in the middle of the street or even on the side he was driving(I was almost on the curb) plus I was wearing a flashing red light, a headlamp and reflective gear. Not sure why he slammed on the horn besides just being a jerk. All it did was scare the crap out of me for no reason and probably wake up a few neighbors. It just came in the mail yesterday. Where did I get it? At cowbell.com of course! I'll be using my new cowbell to help cheer on the half marathon runners of the Brooksie Way Half Marathon on October 2nd in Rochester/Rochester Hills. I ran this last year but since I'm doing a half on September 18th and a full on October 16th, I opted not to do this race. I thought that might be too much running? The plan is to be somewhere on Tienken Road which is between mile 7 and 8. A perfect spot to help keep runners going. I remembered when I did this race that there were not many spectators on this hilly part of the course so I'm hoping my Cowbell will help racers. 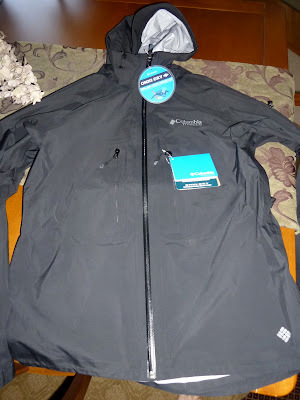 If it rains(and I hope it doesn't), I'll have my Columbia Titanium waterproof breathable jacket. I have not done a complete review on this yet since I'm still waiting for cooler weather so at least it would give me an opportunity to wear this if it rained. Question of the day? When was the last time you cheered on runners at a race? Love the cowbell! I may be running Brooksie Way - still debating but am about 90% sure right now! Will look for you! I have gone back onto the course to cheer on others at my tris this season. Also cheered at Detroit 2 years ago when my friend was trying to qualify for Boston (which she did!) It's really fun - I need to cheer more! Awesome! My friend Renee is running Brooksie Way this year (I wanted to, but you scared me with the "tough course" comment, haha) and I was thinking about going anyway just to cheer for her and the other runners. Wow, we can go cheer for other people????? I love cheering on runners! ADP and I never really run the same race so when he races I'm always there cheering on the runners. SlimKatie - I need an unlike button - I did NOT mean to discourage anyone from running especially the Brooksie which is a great race. Ken - only you! Haha! Erika - hope to see you. If you see me, yell Detroit Runner! I'll be the one with the bell. Haha!